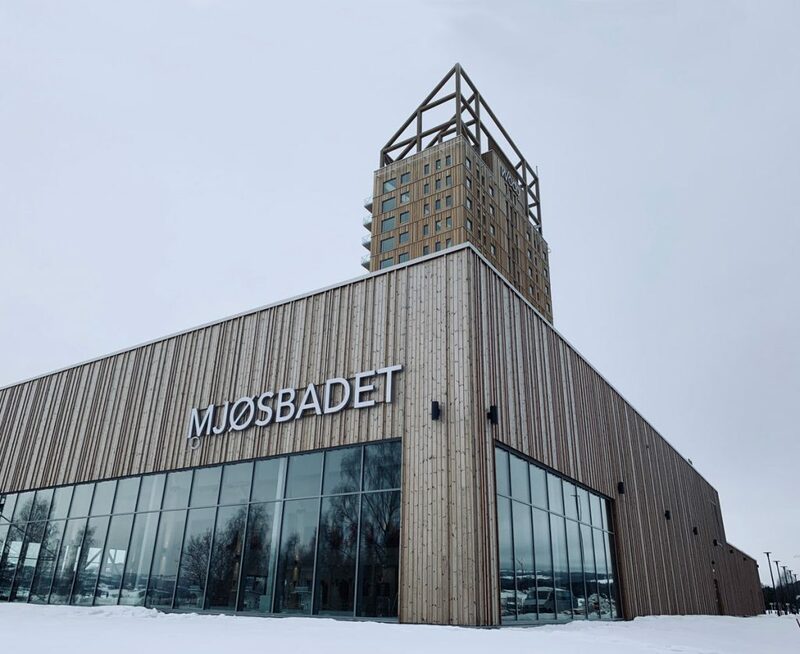 Mjøstårnet is located in Brumunddal, a small city with 10 000 residents, about one hour and a half drive north of Oslo. 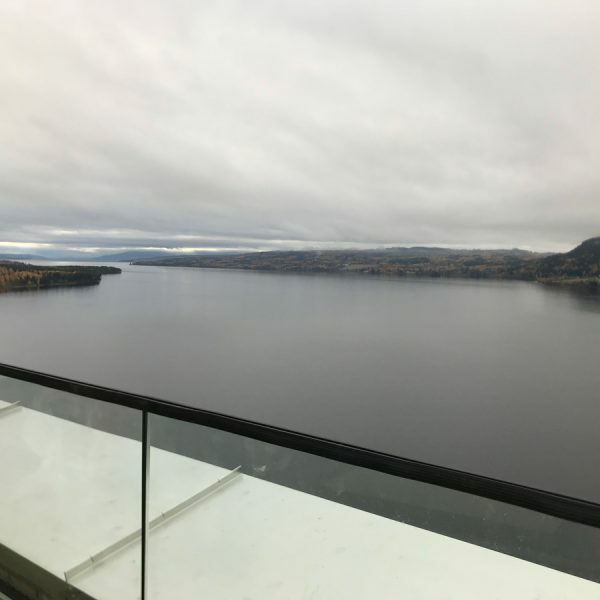 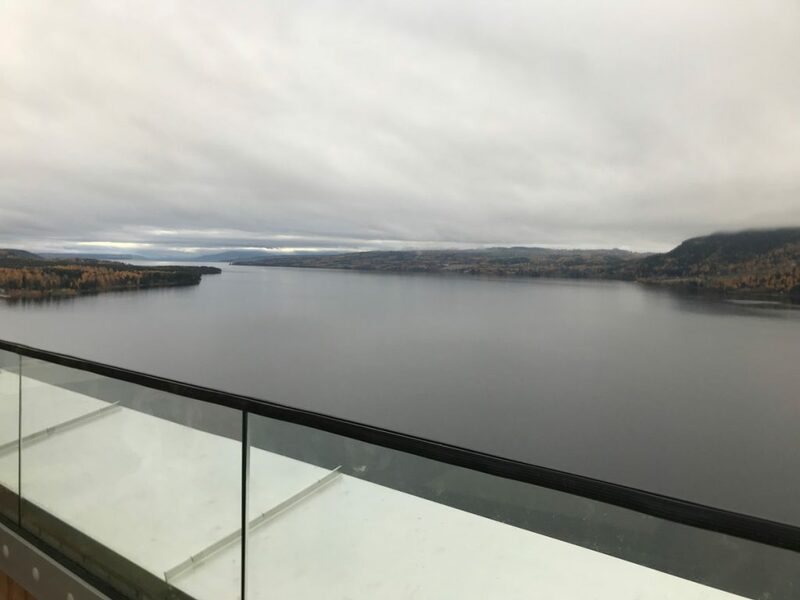 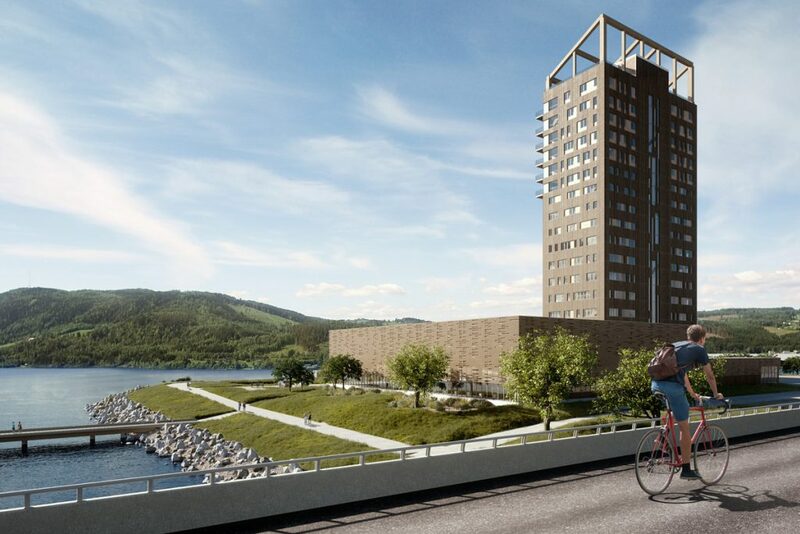 Standing alone on the river bank of Brumunda, Mjøstårnet has a majestic appearance, overlooking Lake Mjøsa, Norway larges lake. 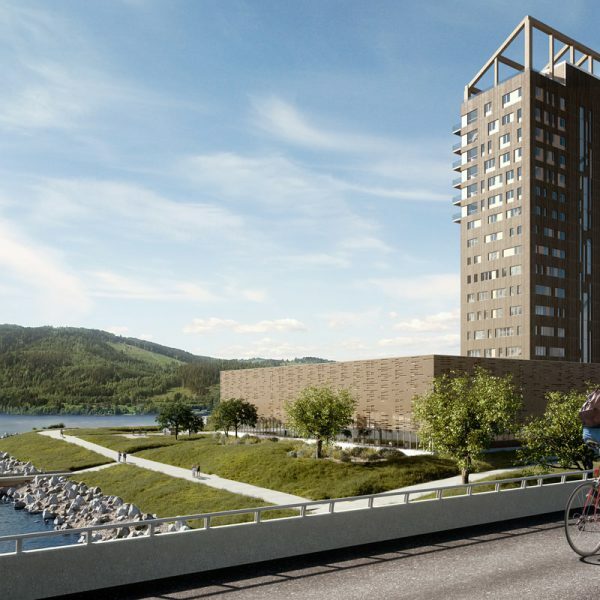 The name “Mjøstårnet” is Norwegian and means “The tower of Lake Mjøsa”. 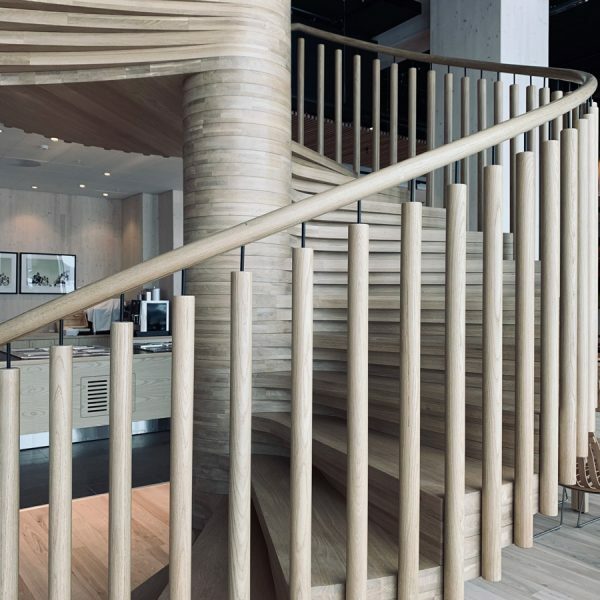 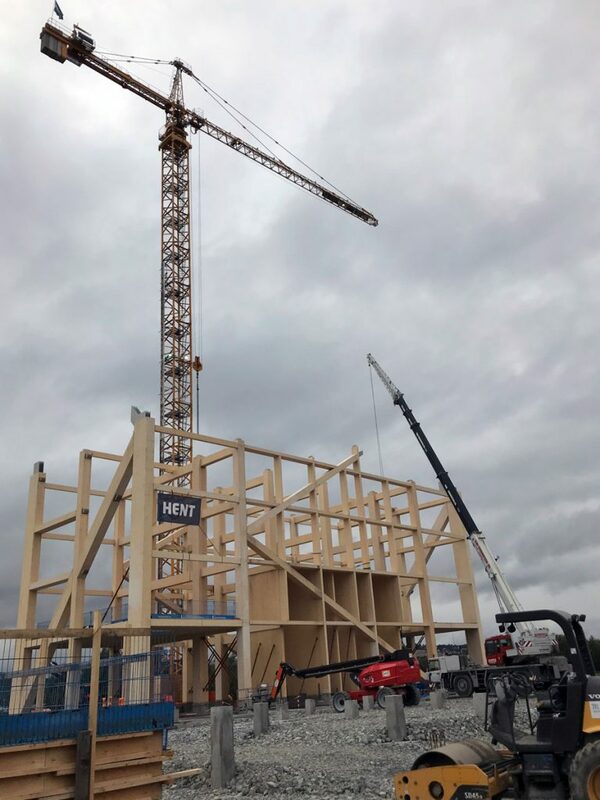 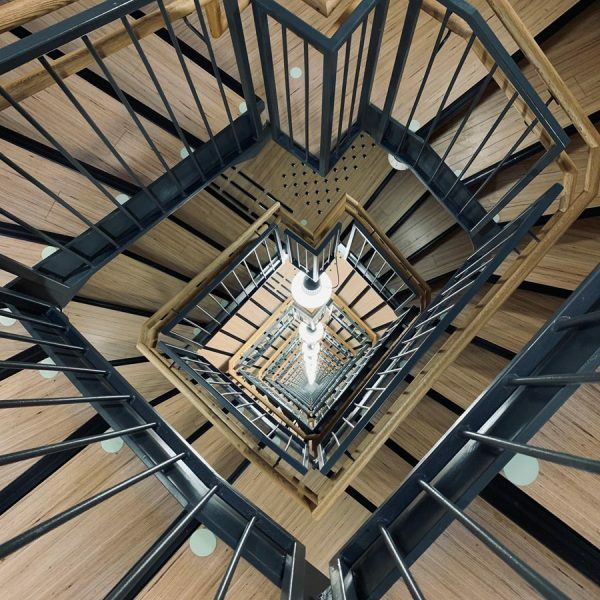 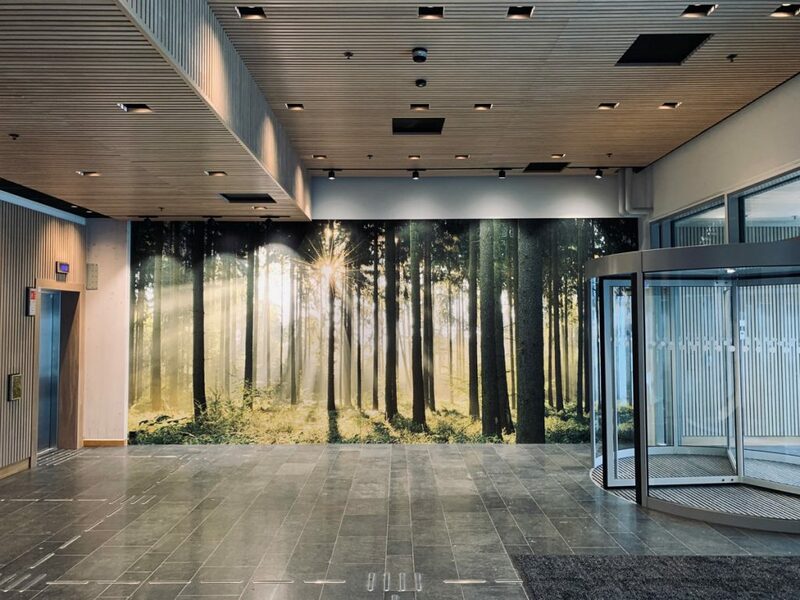 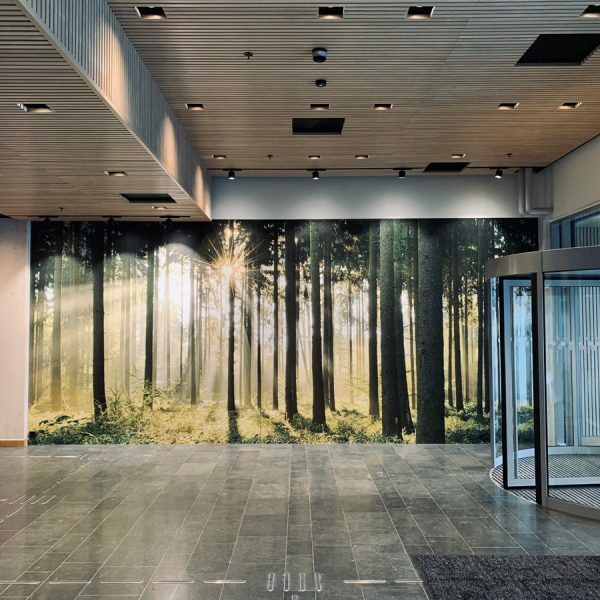 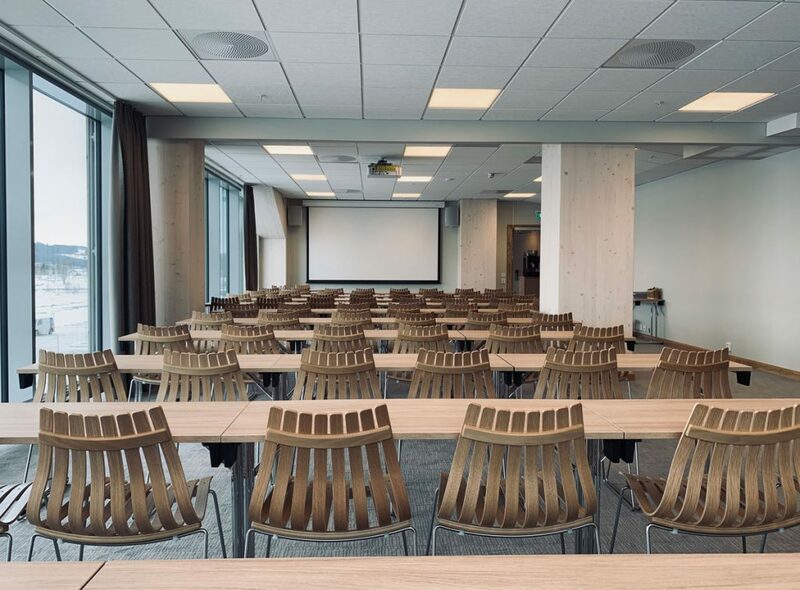 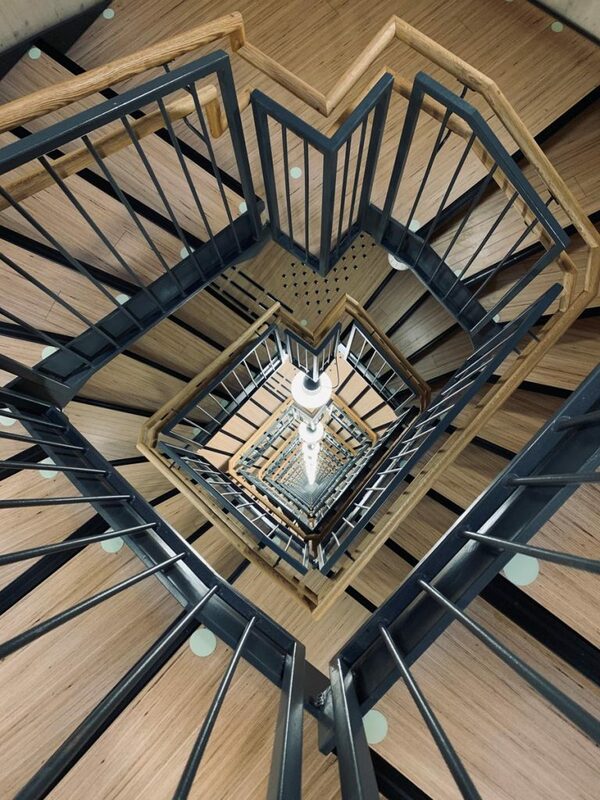 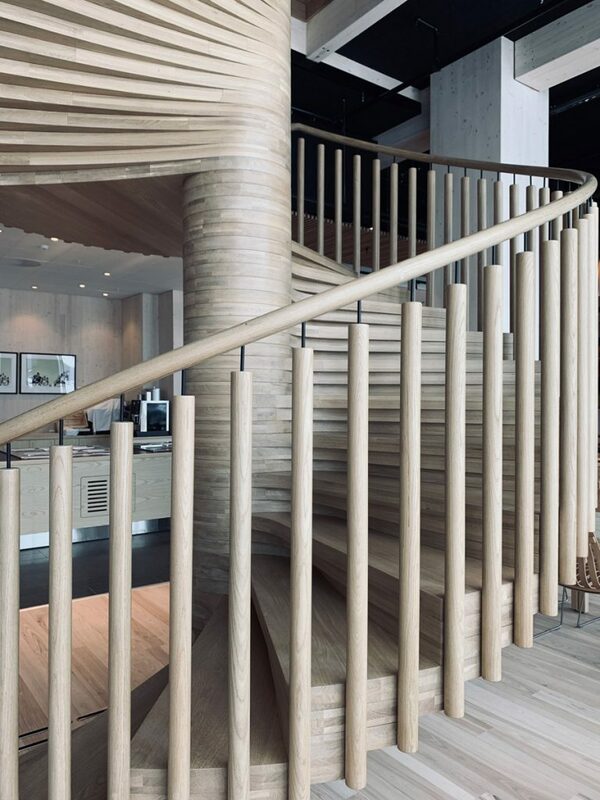 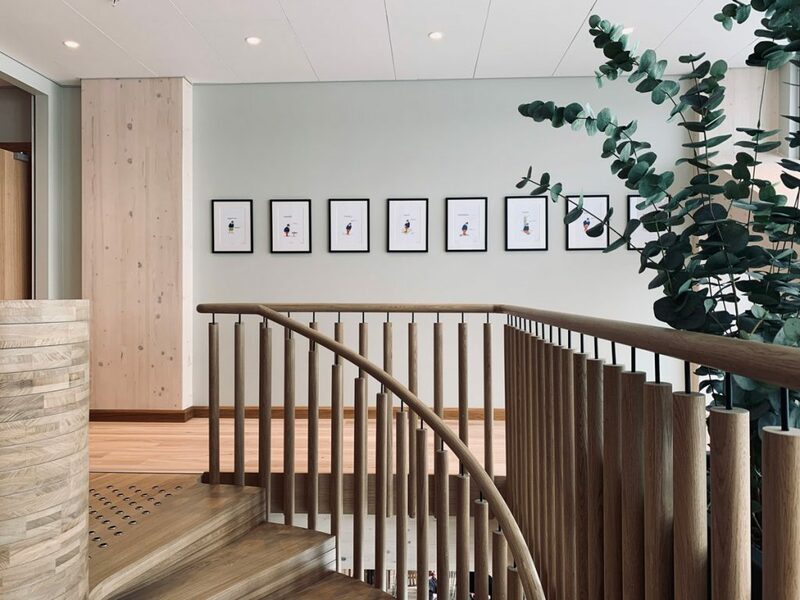 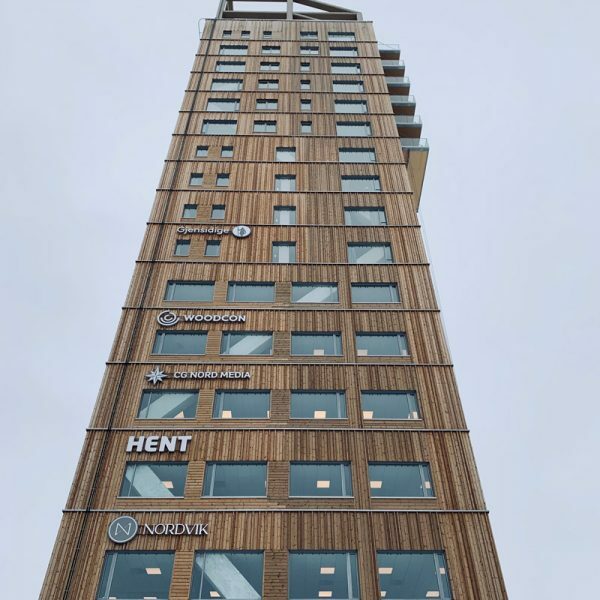 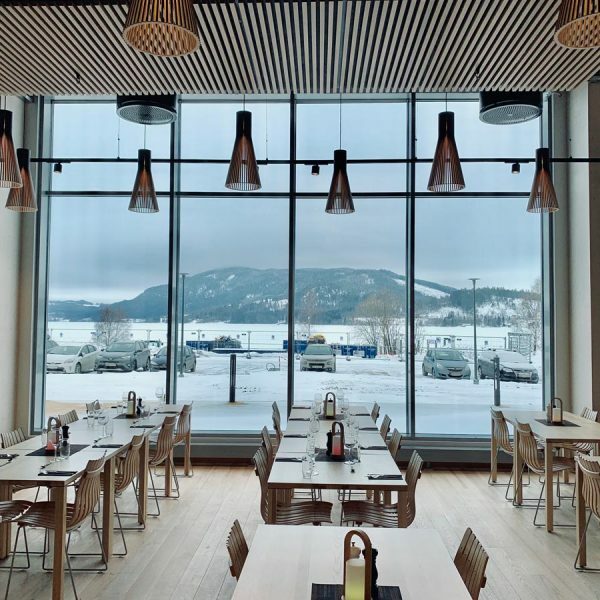 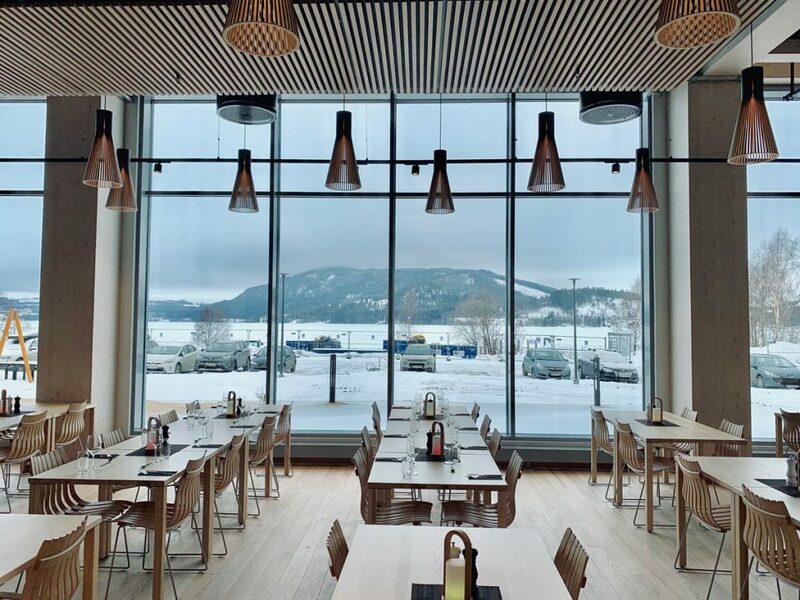 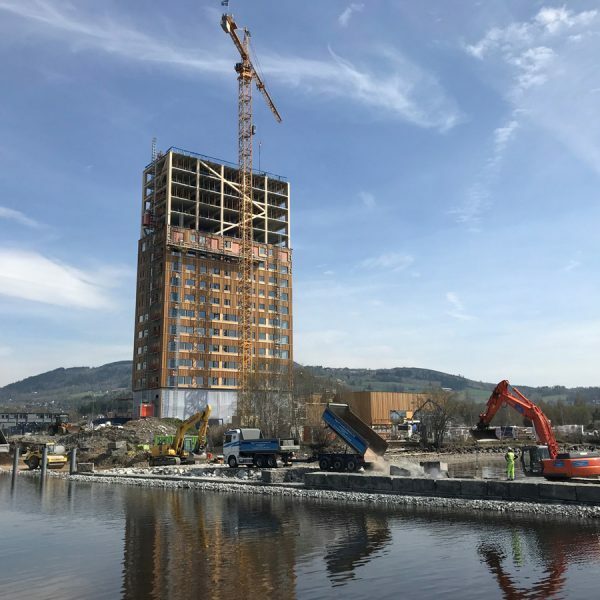 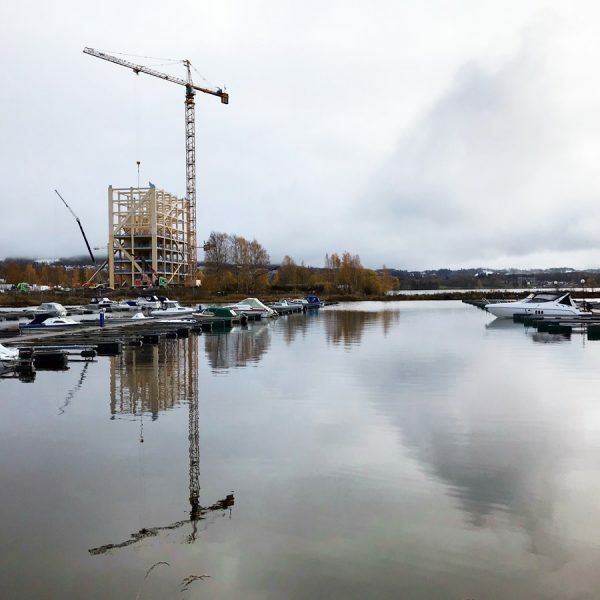 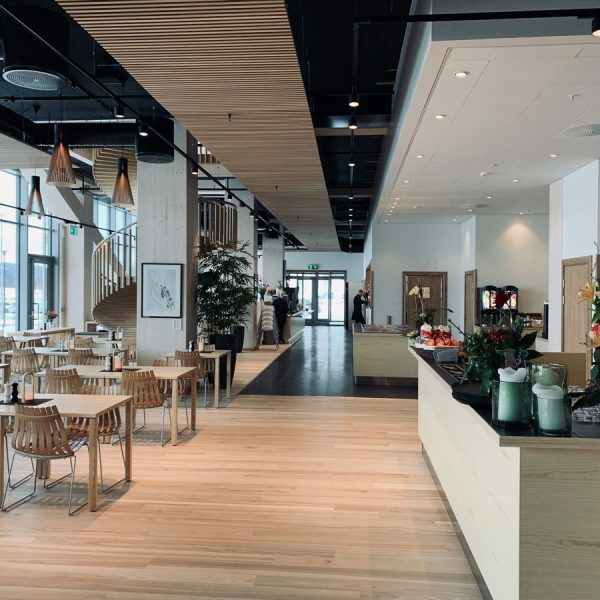 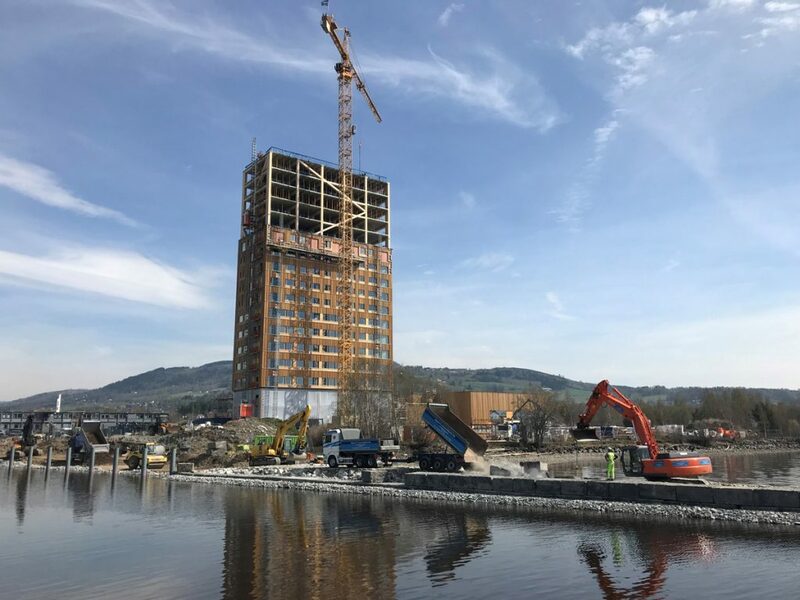 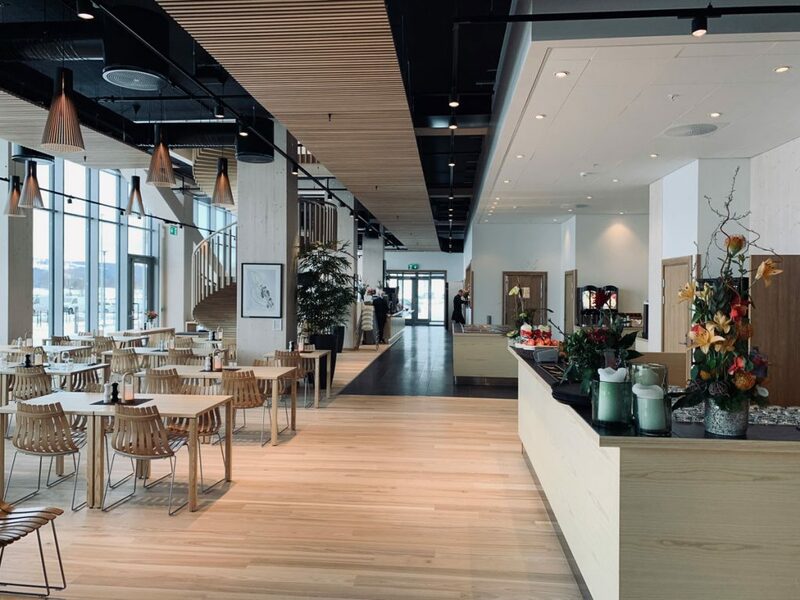 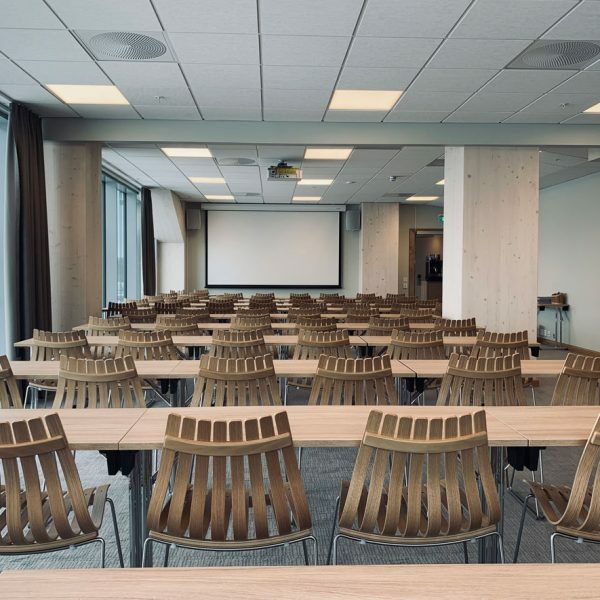 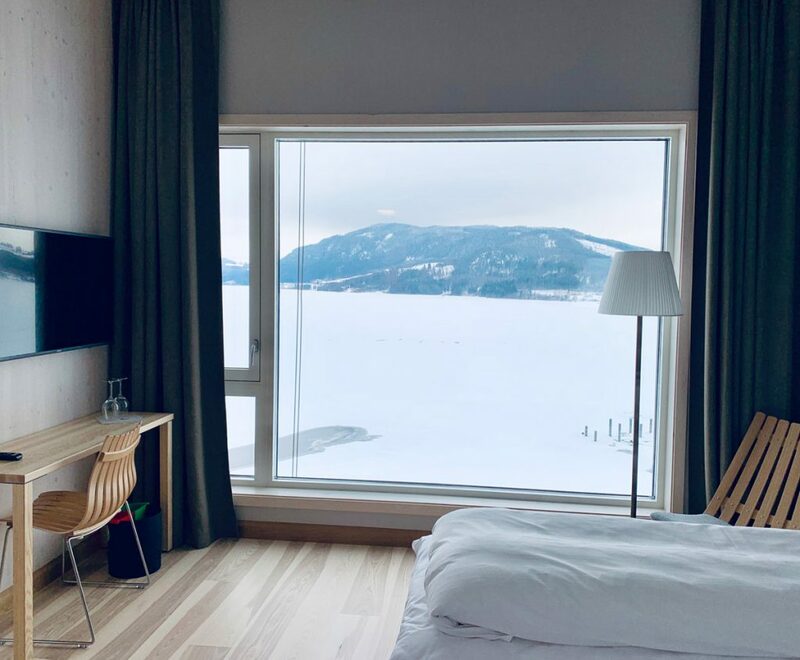 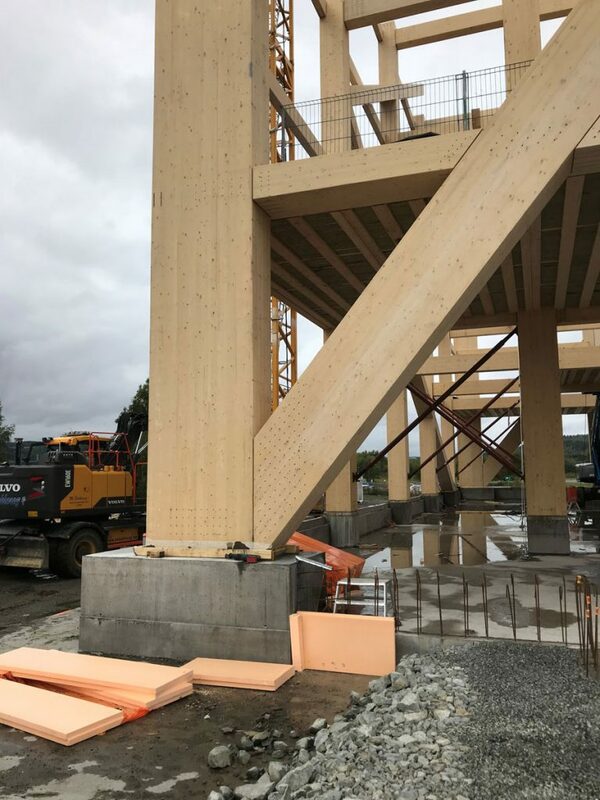 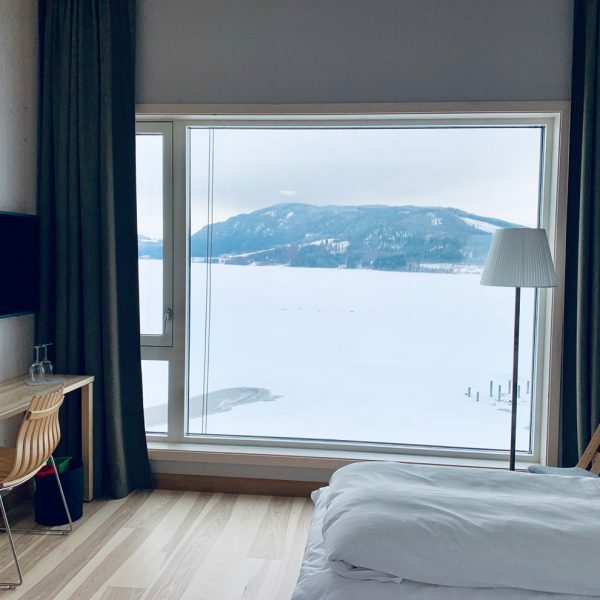 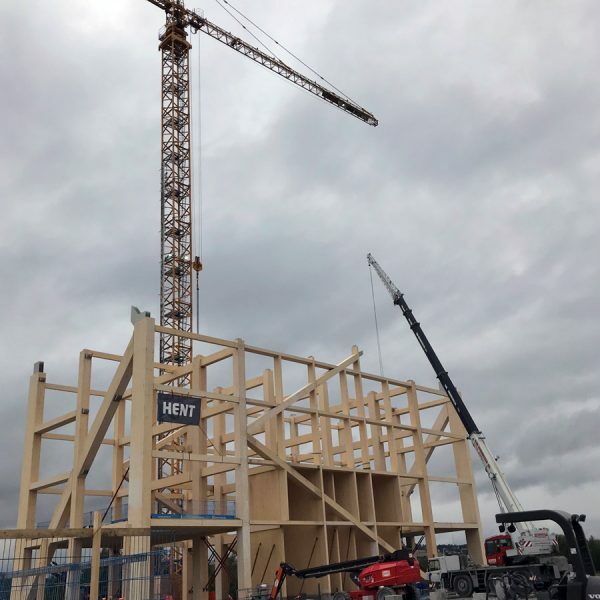 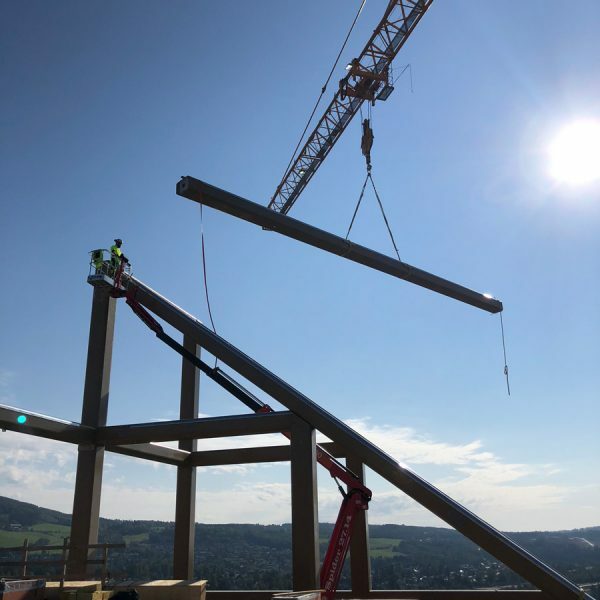 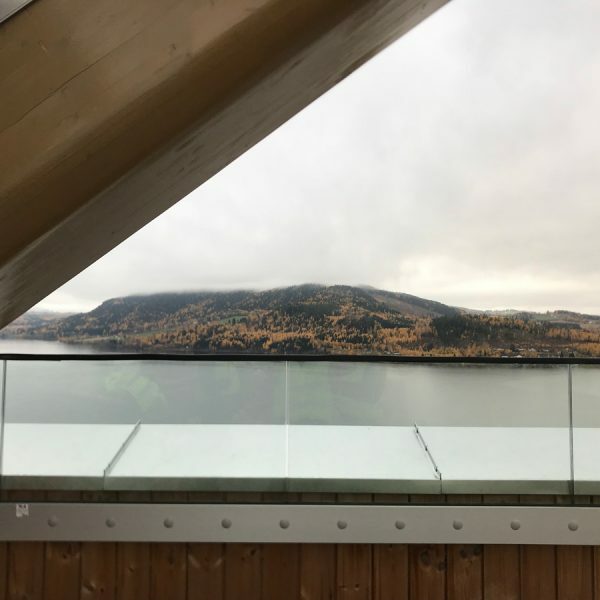 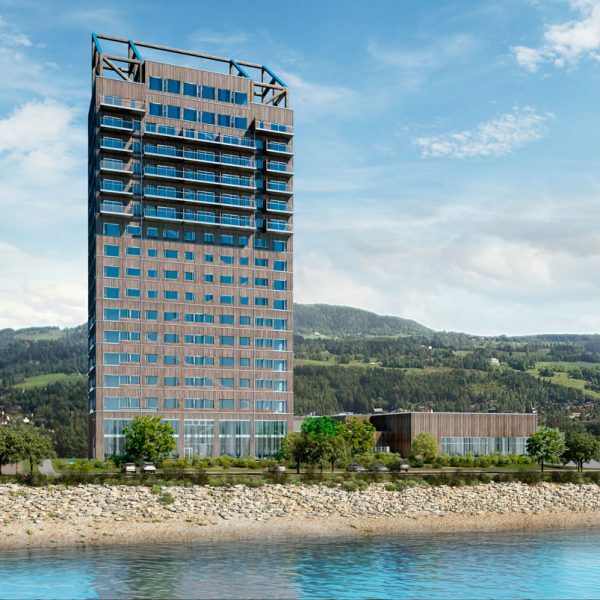 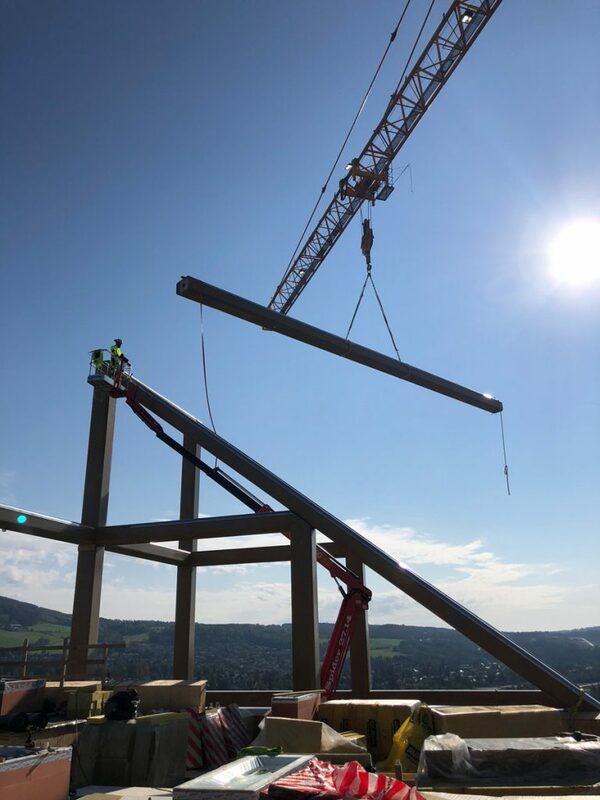 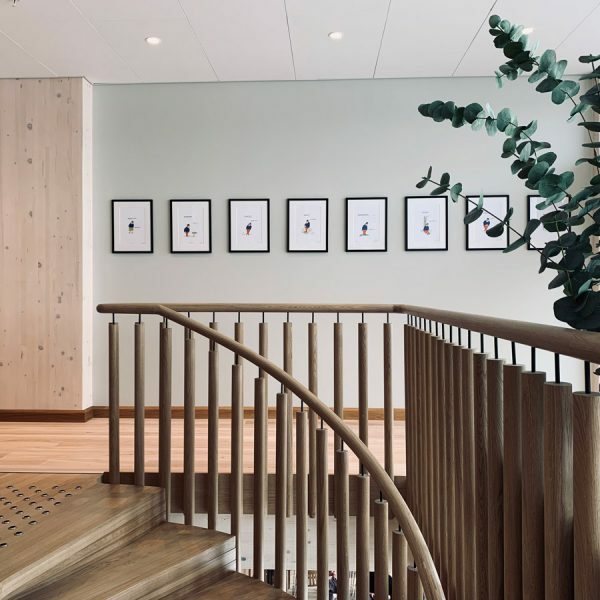 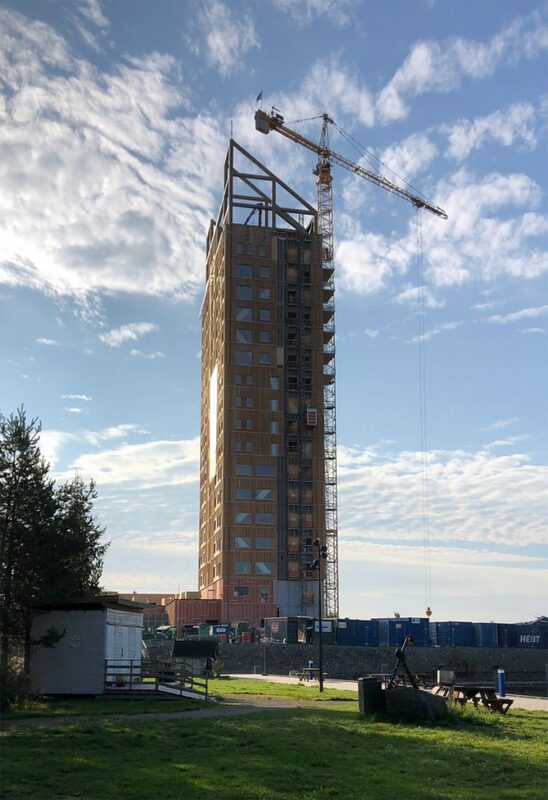 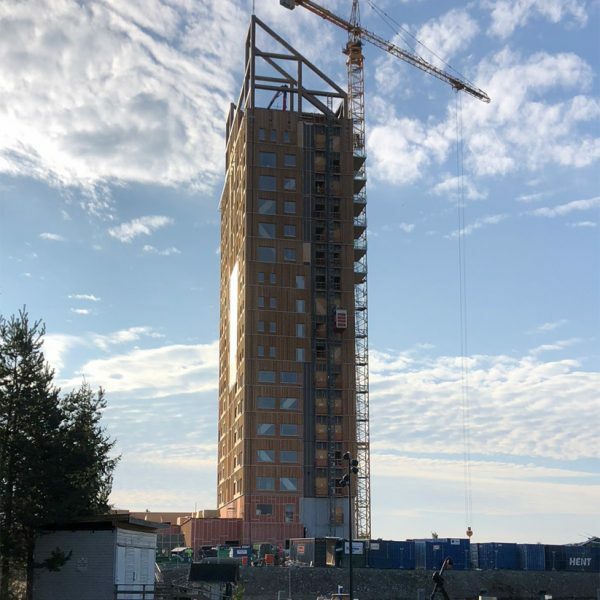 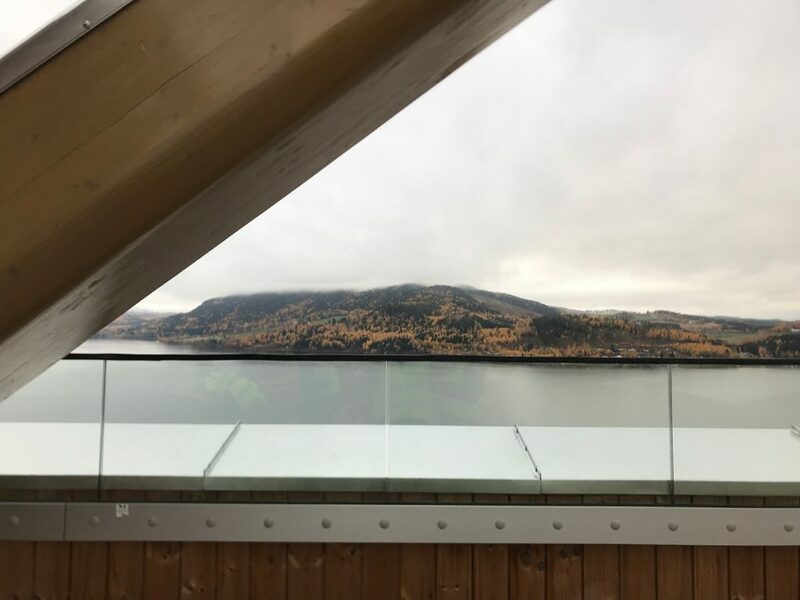 Mjøstårnet is to be a symbol of the “green shift”, and a proof that tall buildings can be built using local resources, local suppliers and sustainable wooden materials. 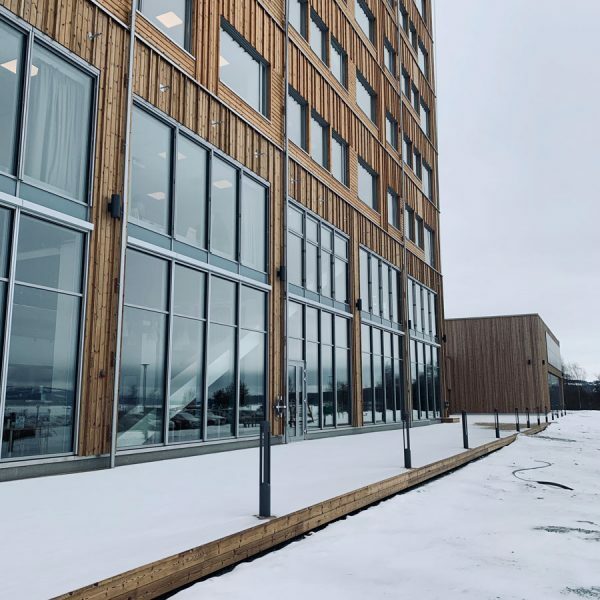 With its distinct architectural appearance, Mjøstårnet is a signal building, both in the way it stands out with its 85,4 meters in the landscape, but also in its revolutionary use of timber in the construction and cladding. 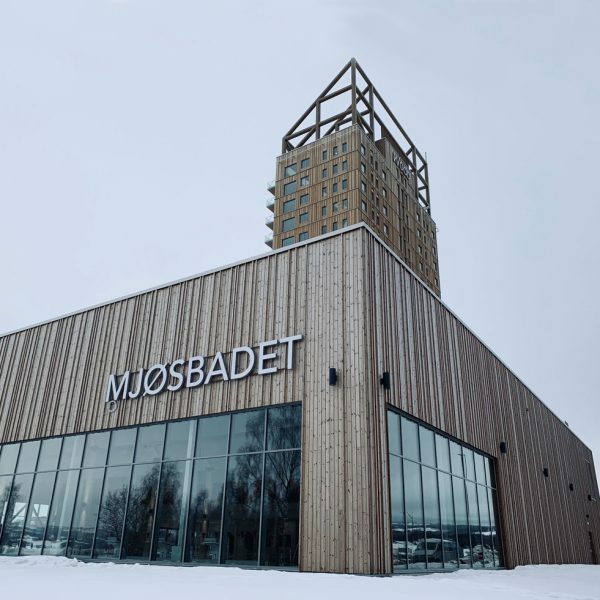 Mjøstårnet is a modern mixed-use tower, with facilities that the residents, locals and visitors can exploit. 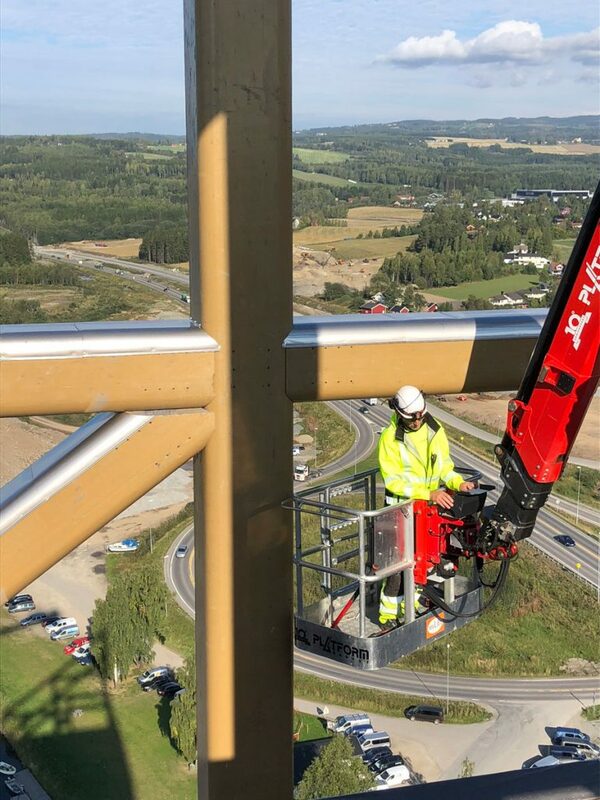 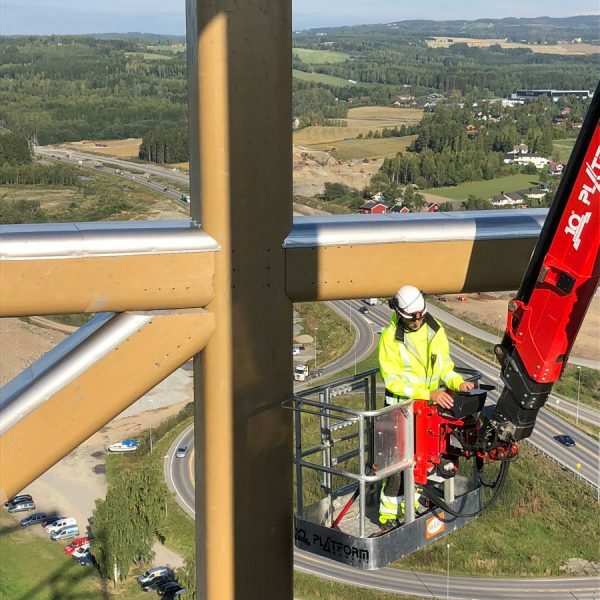 The tower has already attracted a lot of attention both in Norway and abroad. 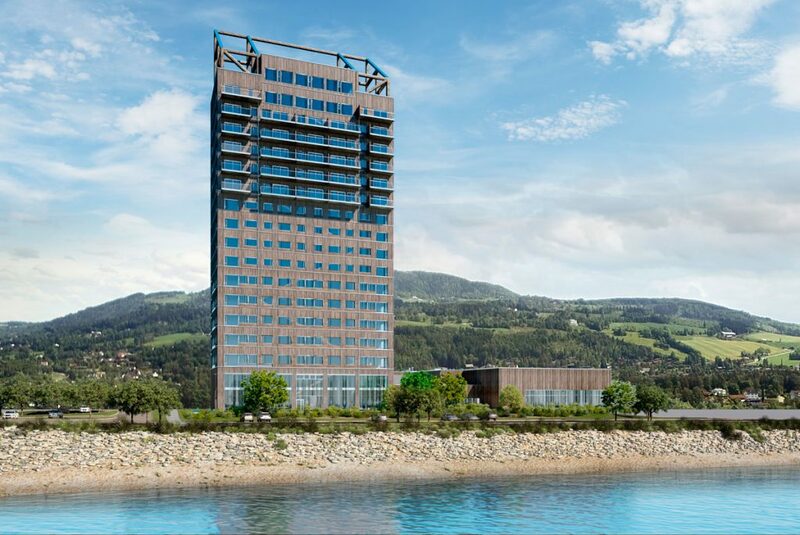 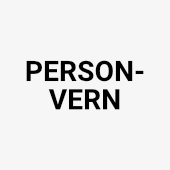 Voll Arkitekter has been responsible for the regulation of the site, the design of the tower and the story layout. 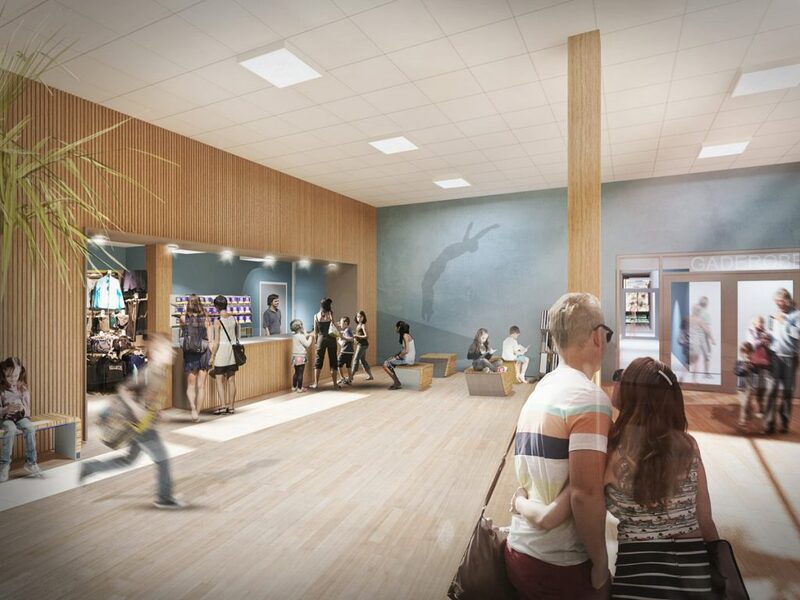 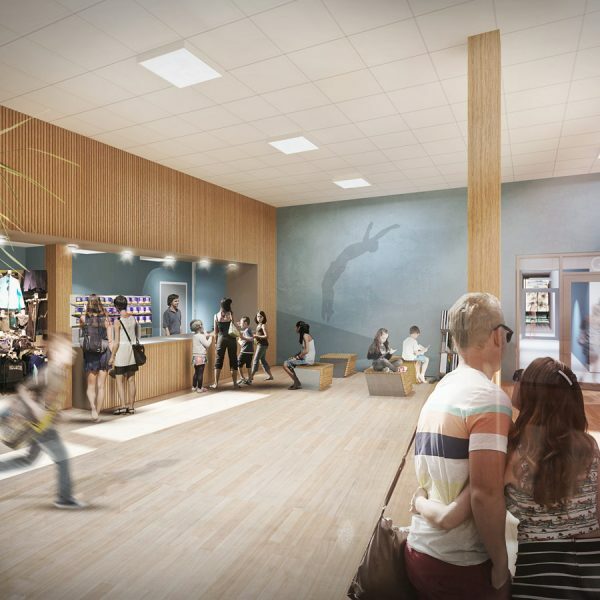 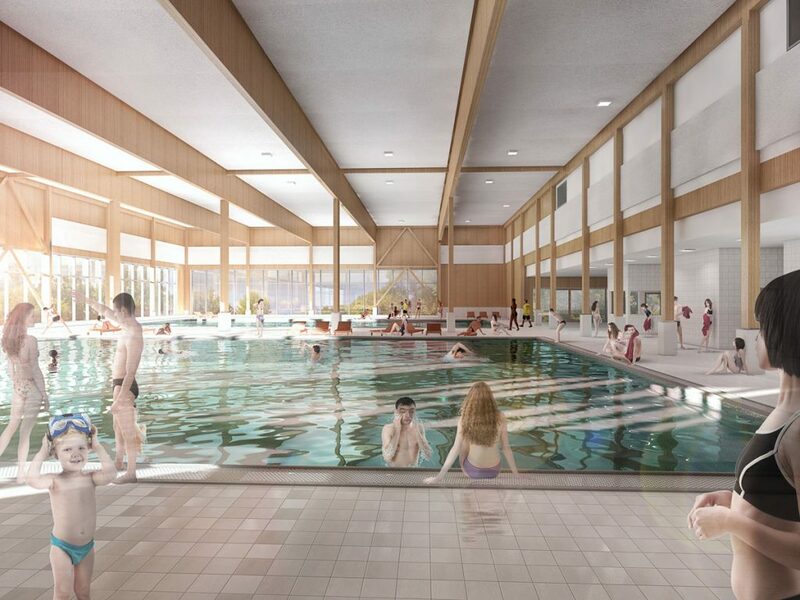 We have also been responsible for the design and layout of the public bath connected to the tower. 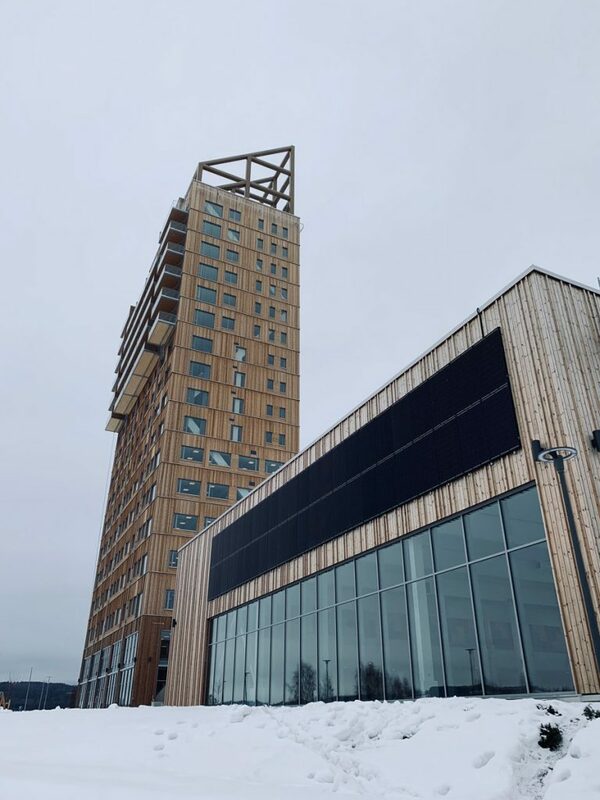 The tower consists of 18 stories with different programs. 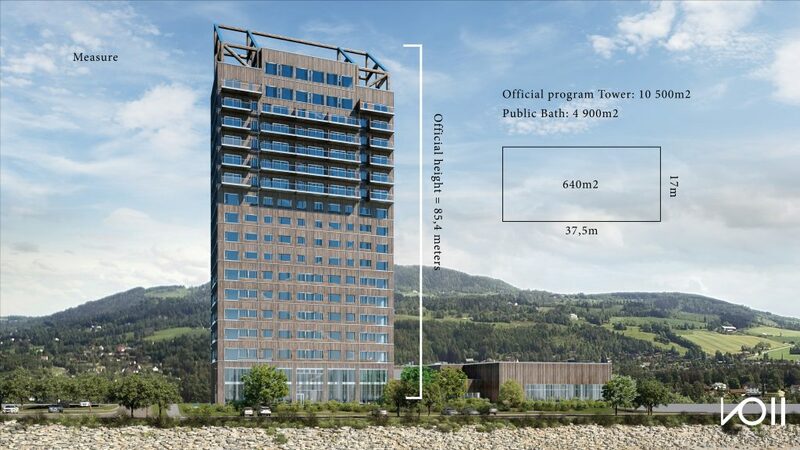 The official height is 85,4 meters. 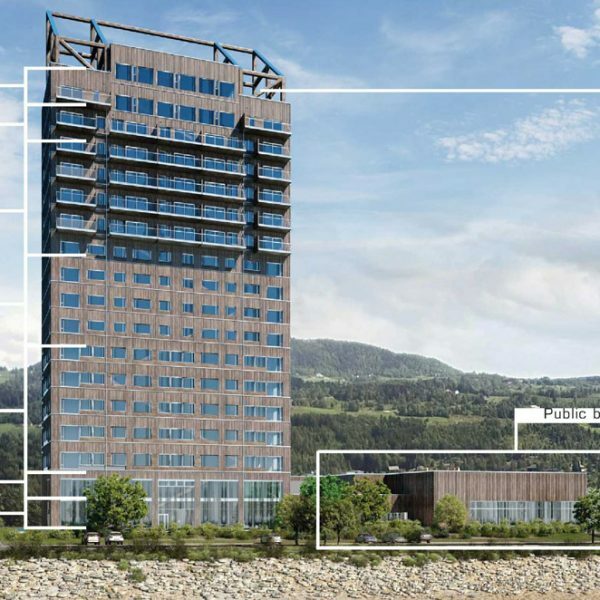 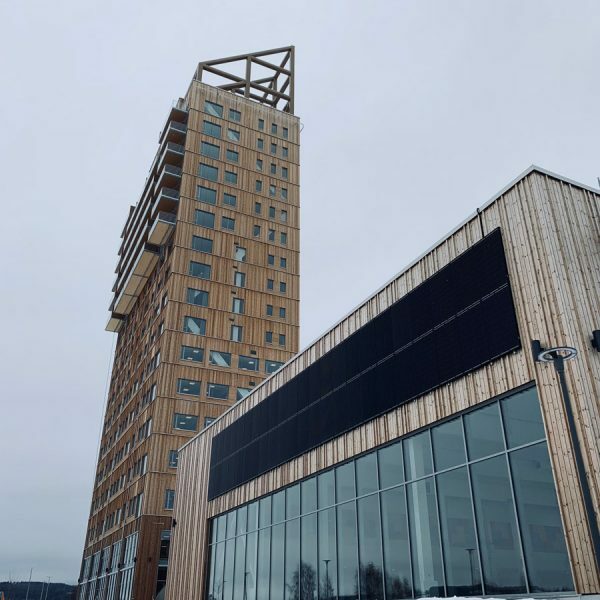 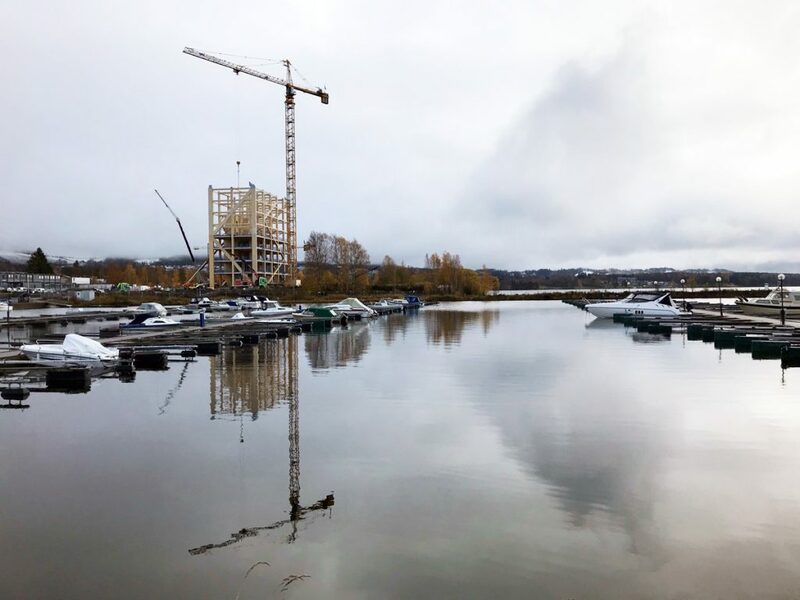 Ani is recognized by the CTBU as the world tallest timber building. 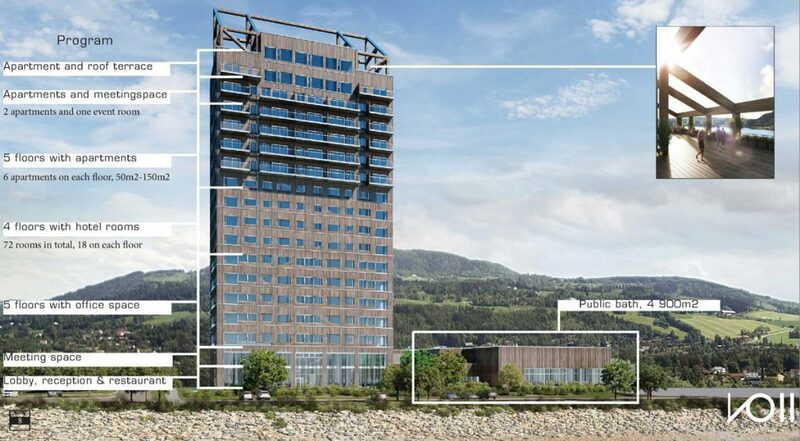 With a footprint of only 17m in width and 37,5m in length, each floor is about 640 m2. 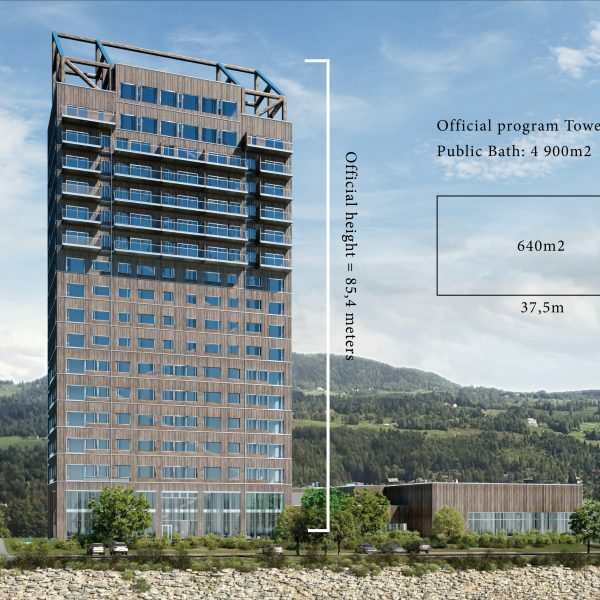 The total program for the tower Is about 10 500m2 with an additional 4 900m2 public bath. 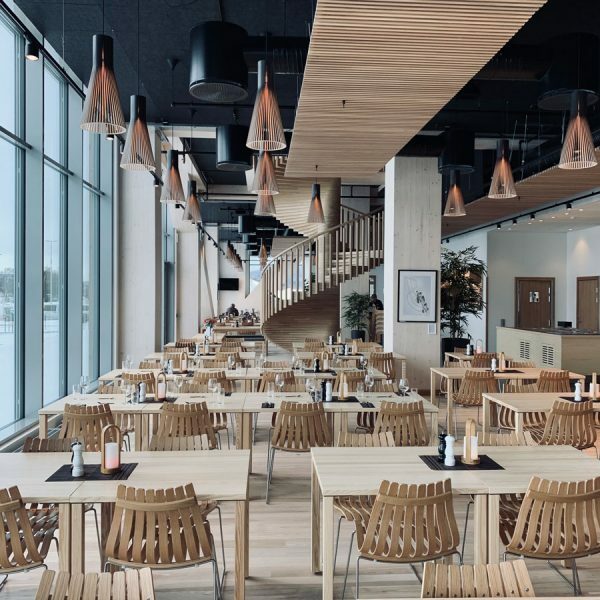 The ground floor is public, with lobby, reception and restaurant. 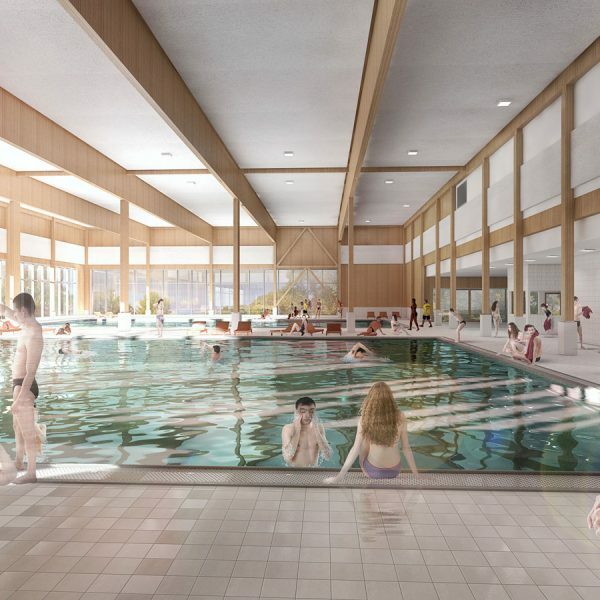 In addition, there is an adjoining public bath on the ground floor with two 25 meters length pools. 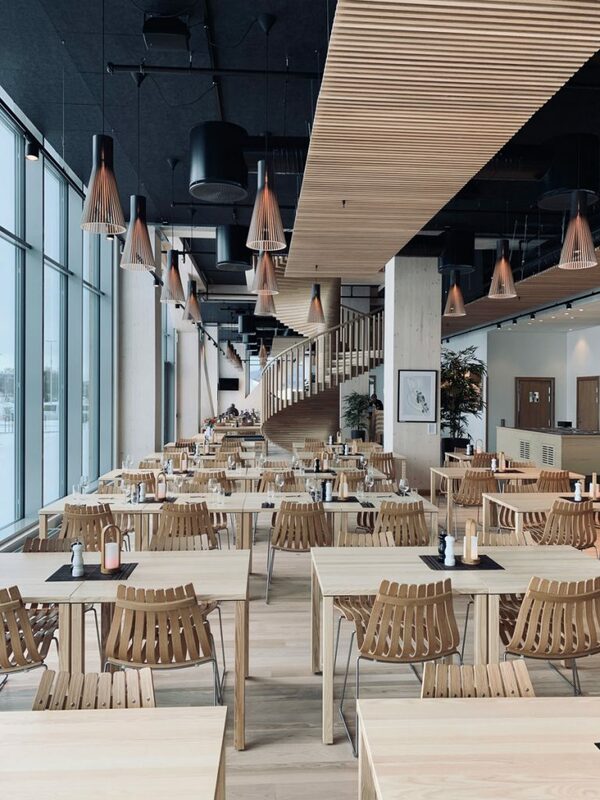 The second story is reserved for rentable meeting rooms and technical facilities. 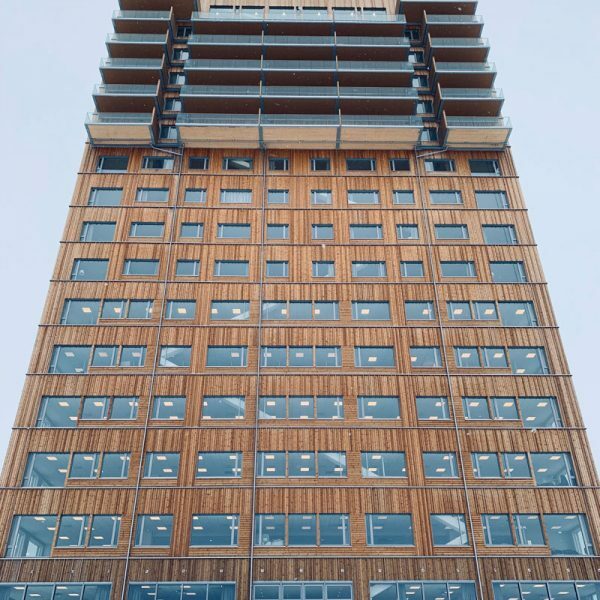 The next five stories are office space. 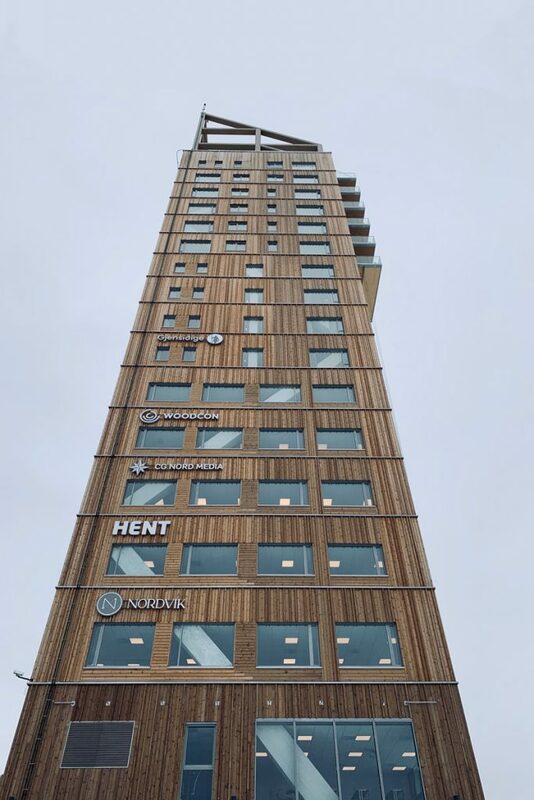 Mjøstårnet have 72 hotel rooms, 18 on each floor from the 8th story to the 11th. 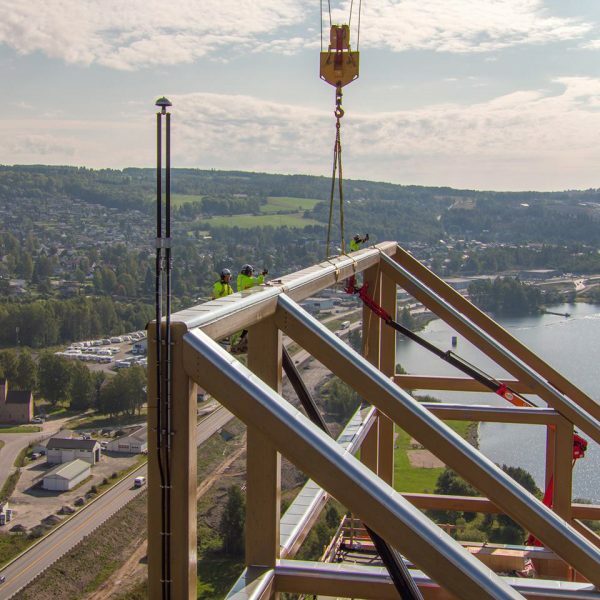 In total there are 33 apartments in the project, ranging from 50m2, to 180m2. 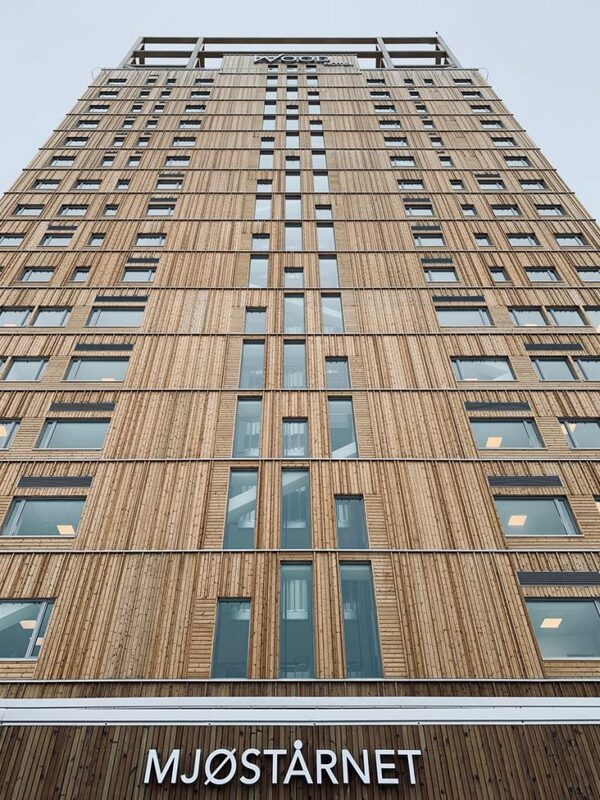 6 apartments on each floor on the 12th to 16th floor. 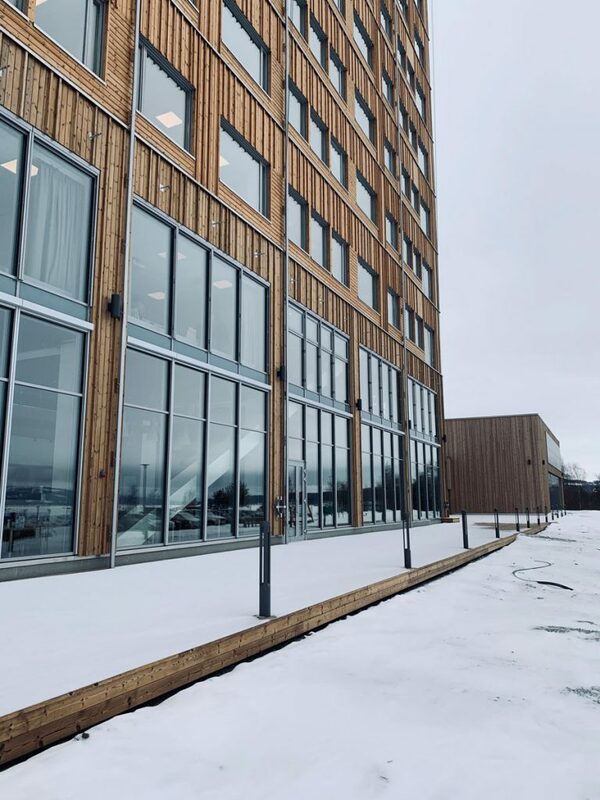 Two apartments on the 17th floor together with an event room, used for weddings, celebrations and larger conferences. 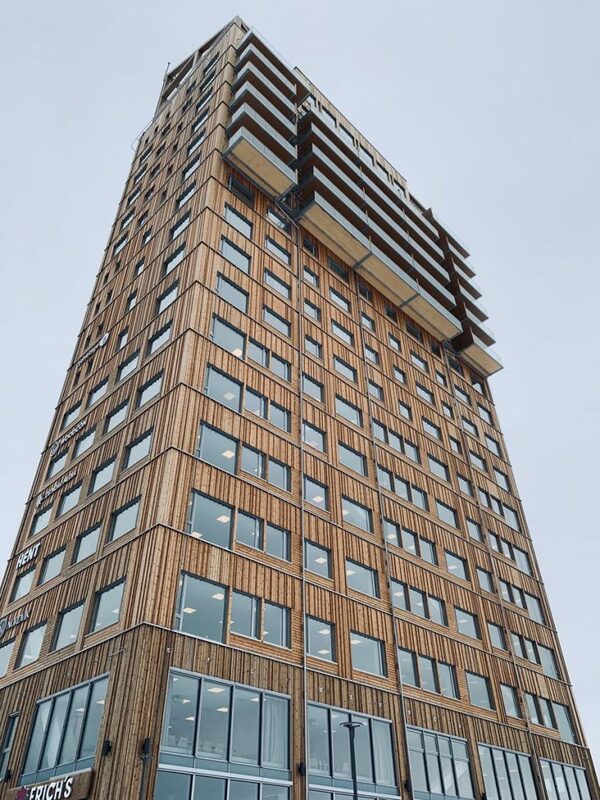 On the top floor there is one penthouse apartment and a public viewing terrace. 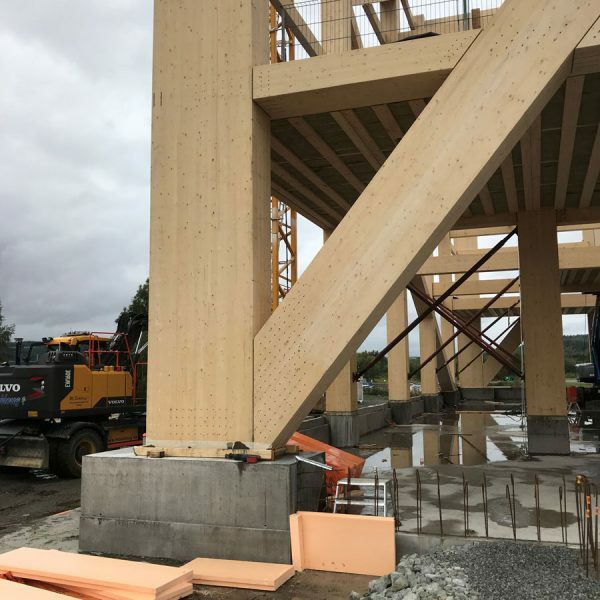 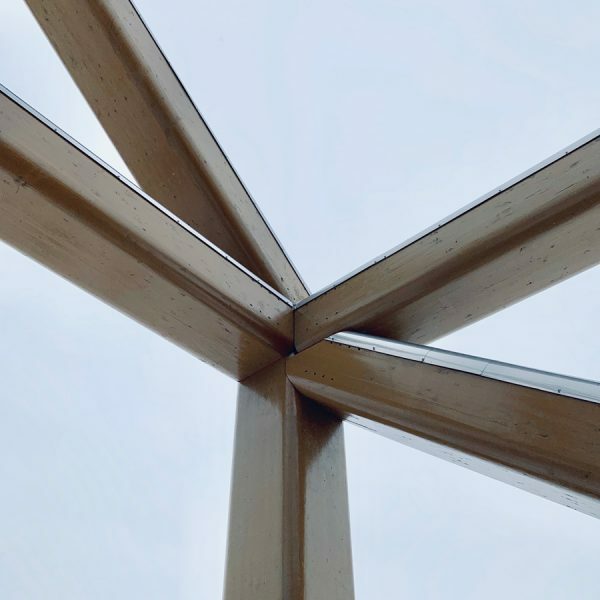 The main load bearing consists of large-scale glulam trusses along the façades as well as internal columns and beams. 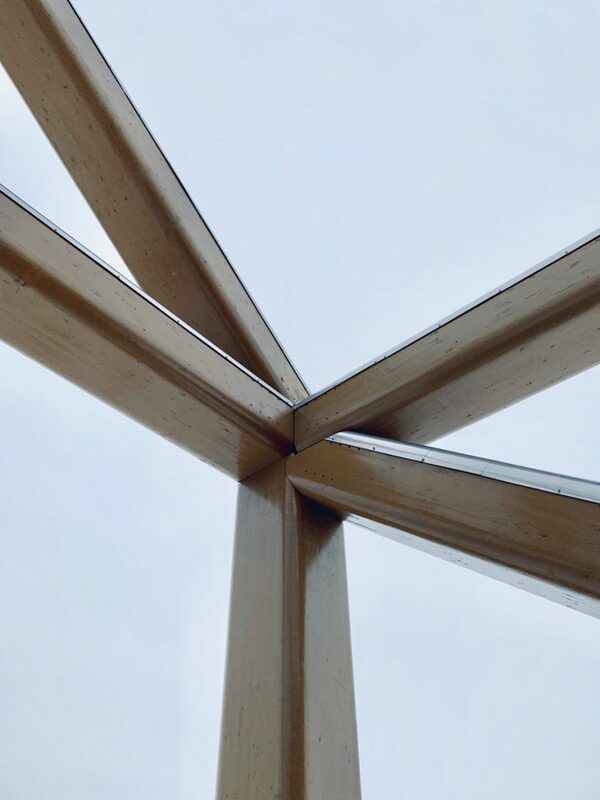 The trusses handle the global forces in horizontal and vertical direction and give the building its necessary stiffness. 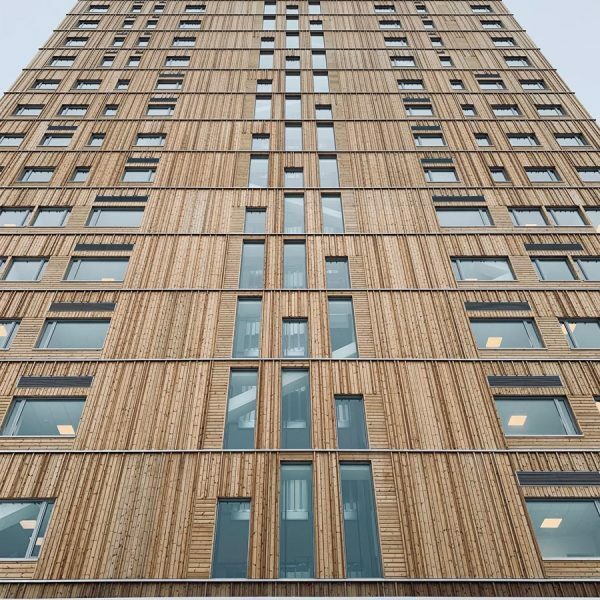 CLT walls are used for secondary load bearing of three elevators and two staircases. 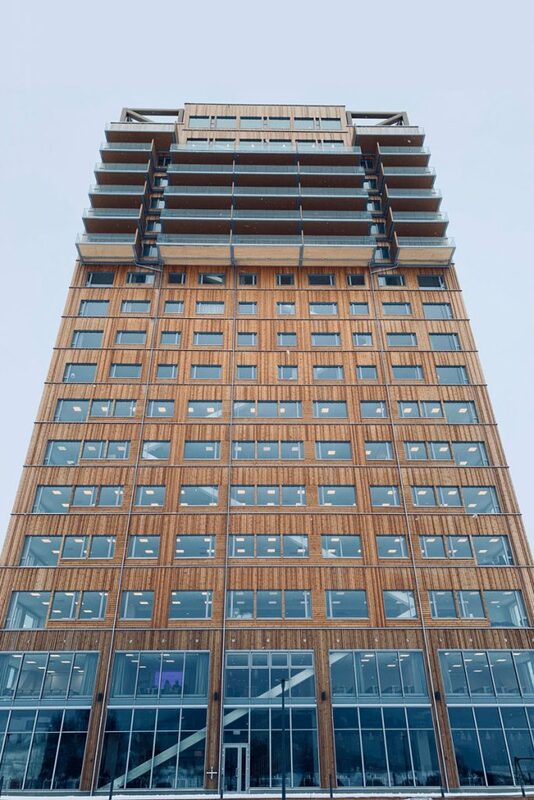 Every wooden part in the facade construction had to be fireproof. 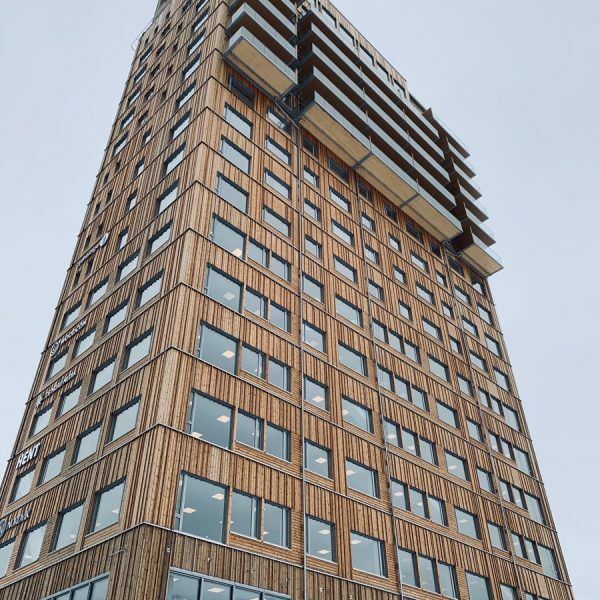 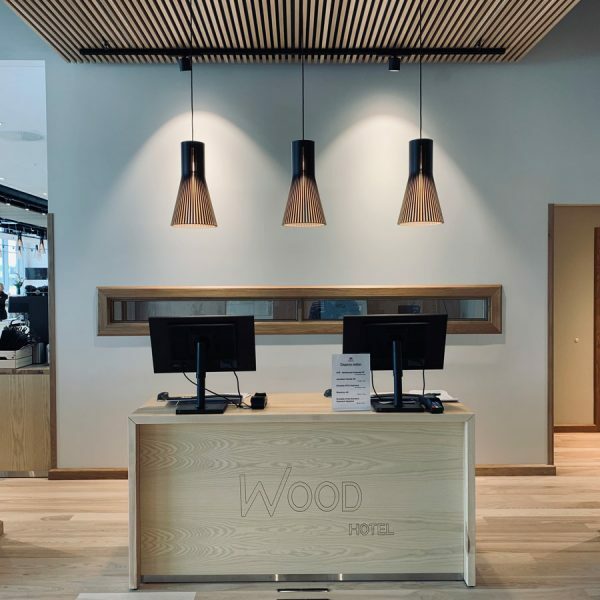 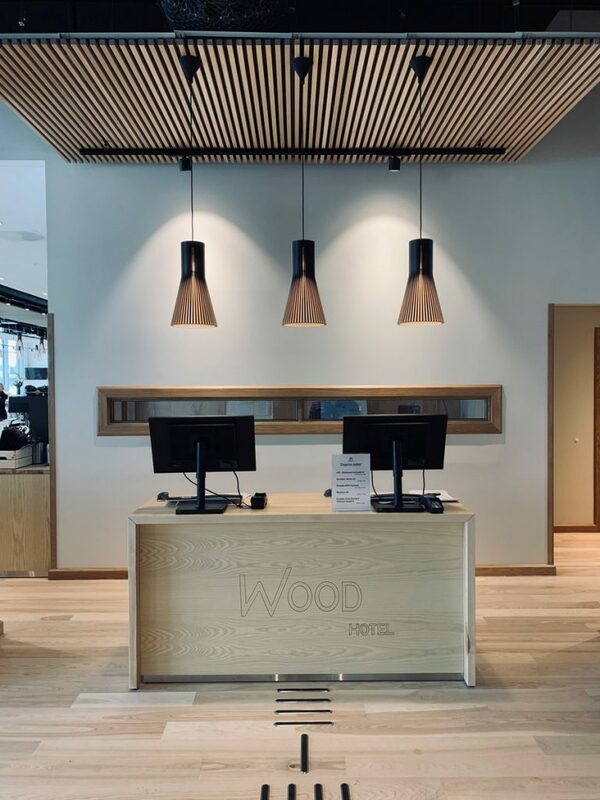 A fire safe pine product from Woodify was chosen for the cladding.